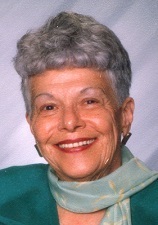 Gretchen Ann Chase, 79, died Wednesday, August 14, 2013 at Kavanagh House. A memorial service will be held on Tuesday, August 27, 2013 at 12:00 p.m. at Hamilton's on Westown Parkway, 3601 Westown Parkway in West Des Moines, Iowa. Visitation will be held one hour prior to the service. Burial will be at the Iowa Veterans Cemetery at a later date. Gretchen was born on November 8, 1933 in Davis City, Iowa to Mabel (Myers) and Loris Stoneburner. She graduated from Leon High School. While working at Ardan's she met Jack Chase. They were married in 1960 after a brief courtship. They celebrated their 50th wedding anniversary in 2010. The couple followed Jack's career to various Iowa cities including Fairfield, Cedar Falls, Traer and Des Moines. Gretchen enjoyed baking, gardening, her family, and her faithful dog, Tag. She was a member of Traer Presbyterian Church. After her husband, Jack's death in 2010, Gretchen made many new friends at Windsor Place playing dominoes and going out for lunches. She is survived by her children, Nancy (Jeff) Stroburg, Shery (Terry Lint) Chase, Jacky (Lee) Garrett, Cathy DeReus, Tom (Penny) Chase; grandchildren, Jake (Kelly), Josh, Emily (Brandon Ballegeer), and Cheli Stroburg, Elliott (Kate), and Jordan Florer, Bailey (Phil Martinez) DeReus and Allison (Nick) Neese, Abbie, Steven and John Chase; seven great-grandchildren and one on the way; and her sister, Kaye Stevens. Gretchen was preceded in death by her husband, Jack Chase; her parents; sister, Sharon Eckstrom; and her brother, Fred Stoneburner. In lieu of flowers, memorial contributions may be directed to Kavanagh House Hospice, 900 56th Street, Des Moines, Iowa 50312 or to The Humane Society of Indianola (Kiya Koda), 1206 N. Jefferson Way, Indianola, IA 50125. Online condolences may be expressed at www.HamiltonsFuneralHome.com.